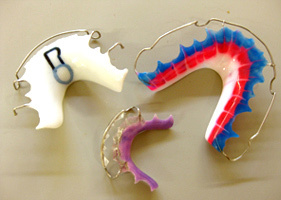 Retainers are the time to “set in stone” your final treatment, and from time to time you may have a stray patient show back up with the story of “I didn’t wear my retainers.” We make many variations of retainers and will make whatever you prefer. We also can reset teeth or add springs for any final adjustment you may want to make after the patient is out of treatment. We offer many special acrylic variations. Neons, tropicals, glitters, pictures, and carves.